I'm hoping someone here can shed some light on this - I have windows that look like they should kip, but don't. 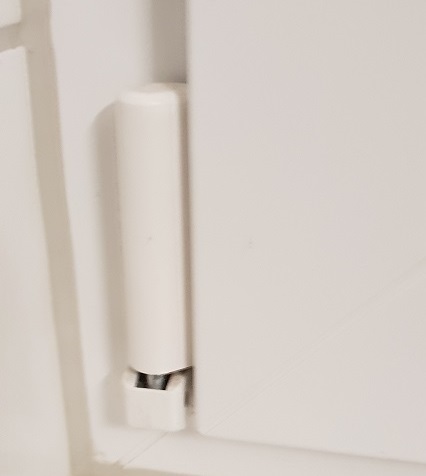 They have the correct hinge assemblies as far as I can tell, but the handle will not rotate upwards to allow the window to tilt. This leaves me with only two options, "no ventilation" or "cats can escape"
Can anyone shed some light on how I can enable the kip? The windows are from Scherer AG, photos of the hinges attached. It's normally with the handle in the 'up' position. (Down being closed and horizontal being normal open). If you do have cats, I'd be careful of leaving the windows in the tilt position as if a cat tries to climb out and slips down, they'll get stuff in the V and could get seriously injured or worse. Yep that's the case, but it won't turn up and kip. The handle's range of motion is 90 degrees, horizontal to pointing down. It's like the gearing is pinned to prevent it turning vertical and unlocking the kip. And regarding the cats, I'm careful with them - however right now, they've learned how to push through the rollers and escape to the roof. One of them did that then fell off, so I keep everything buttoned up. If it kipped, I could block the "V" pretty easily. It doesn't look like this is a "kip" window. I have just compared two of ours. They are identical except one kips and the other does not. The visible difference is in the top bar. 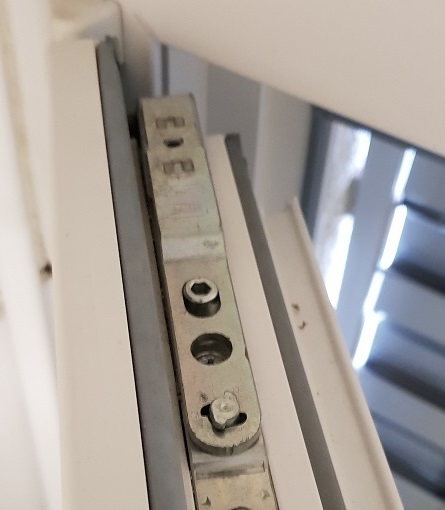 In your case, the bottom hinge looks like it could kip, but the top bar does not look long enough to do anything useful apart from locking the window shut. Have we invented a new word on this thread? It's a tipping window where I come from. I'd have thought it was a "Kippfenster" in Basel. Or is your location not up to date ? Exactly. Some of ours are designed to tilt and some aren’t and the only difference is the bar at the top. They look identical apart from that. It’s a tilting window to me. Never heard of them referred to as kipping windows before. Yep, and in German "kippen" means to tilt. So "tilting window" is a good English translation, though this may well be a case where knowing the common German term is more important than English accuracy - to search for the relevant cat guards or conversion components in German speaking Switzerland, 'Kippenfenster' is probably the key word to use, ask for in the shop, etc. Thanks. I'll ask the landlord but I suspect you're right... I wonder if I can convert a couple without incurring the wrath (or enormous expense). It'd be nice to be able to kip the bathroom and kitchen windows once in a while. And regarding the kip/tip/tilt thing... believe it or not, I'd never even thought of the translation even after reading up on "tip & turn" windows. First I ever saw of the design was in Germany, and a) it blew my poor deprived Canadian mind b) I never questioned why that action was called kipping. Depending on how motivated your cats are, and how high your ceilings are, you might need to block more than just the V.
Our windows tilt/kip, but there's a cat-sized gap between the top of the window and the ceiling. A motivated cat could bound up and over anything blocking only the V.
Location: out n about - it's summer! You can get windows changed in your flat, I've done it in two flats as I insist on this type in the bedroom. I don't remember the price but as I don't I can't have been a knock out. You are basically improving the flat, no reason for the landlord to complain about it when you leave.